Ryan & Ryan is a dynamic father-son piano duo that blends classic and contemporary music into an enthralling concert experience. From Rachmaninoff to Gershwin to Billy Joel, Donald and Barron Ryan combine their talents to create a dazzling blend of old and new schools. A native of Trinidad & Tobago, Donald came to the United States to study music, earning degrees from Oral Roberts University and the University of Tulsa. He is well known as a master of diverse styles—evidenced by a diploma from the 9th International Chopin Competition as well as his induction into the Oklahoma Jazz Hall of Fame. Donald has also earned the distinction of being among the most accomplished pianists in the world as a Steinway Artist. Given his father’s profession, Barron’s choice of playing the piano is no surprise, and he has been no stranger to the stage since the age of four. He distinguished himself on the instrument as a master technician who is particularly gifted at stride, ragtime and boogie woogie piano. 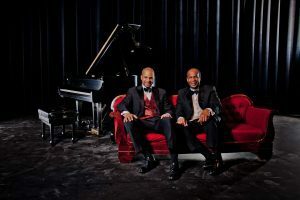 CLINIC: Ryan and Ryan will bring their piano expertise to Jazz In June’s clinic titled “Classic Meets Cool – 88 Keys To Success”, where they will illustrate and detail the various approaches and applications for their instrument of choice. Friday, June 15th from 2-3:30pm.